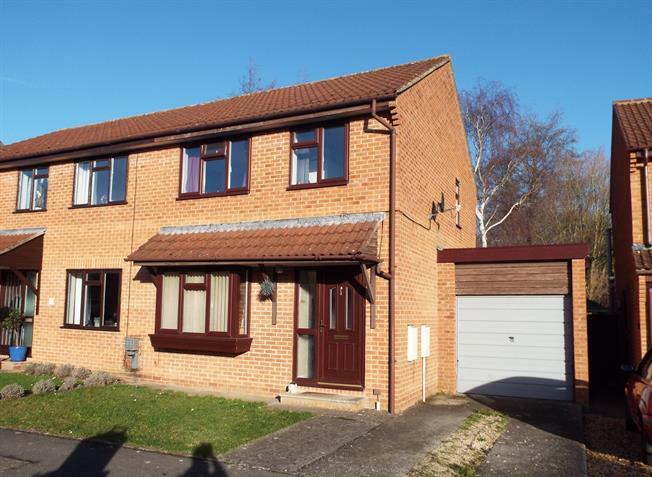 3 Bedroom Semi Detached House For Sale in Wells for Asking Price £250,000. A well presented three bedroom semi detached family home situated in the popular Bishopslea Close with parking and garage. This property briefly comprises; entrance hall, double aspect living room with french doors leading out to the rear garden, kitchen overlooking the rear garden with side access out to the garage which benefits from power and plumbing for washing machine. On the first floor you will find two double bedrooms, single bedroom and recently modernised bathroom. The master bedroom benefits from a built in wardrobe. The rear garden benefits from being private. UPVC front double glazed door. UPVC windows with patterned glass facing the front. Radiator, vinyl flooring. UPVC French double glazed door, opening onto decking. Double aspect double glazed uPVC windows facing the front and rear overlooking the garden. Radiator and electric fire, carpeted flooring. Double glazed uPVC window facing the rear overlooking the garden. Radiator, laminate flooring, under stair storage, part tiled walls. Roll top work surface, fitted, wall and base units, breakfast bar, stainless steel sink, space for freestanding double oven, gas hob, over hob extractor, space for dishwasher. Single bedroom; double glazed uPVC window facing the front. Radiator, laminate flooring, a built-in wardrobe. Double glazed uPVC window with frosted glass facing the rear. Heated towel rail, vinyl flooring, tiled walls. Plumbing and power for washing machine, fridge and freezer.